If you read food blogs, food websites, watch travel shows or read food magazines about Portland, this restaurant seems to come up over and over again. My first visit to Pok Pok was 2 years ago and this place was popular then. But now it seems like it’s exploded. 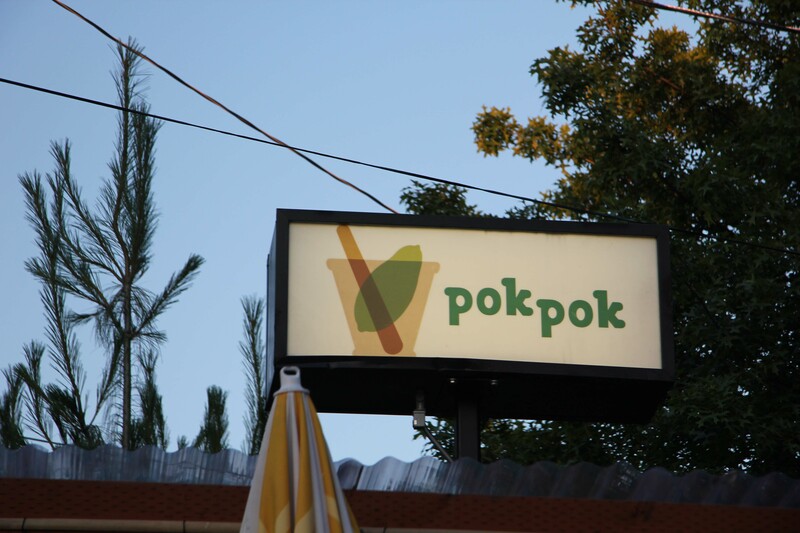 I’m not going to go into their history or background if you want that, just google Pok Pok. Pok Pok doesn’t take reservations, so expect to wait. But to help pass the time, they’ve recently opened a Whisky Soda Lounge across the street. It looked fun and it’s the same drink menu as Pok Pok, so I’m sure the drinks are good! We arrived at 8:30 on a Friday night and were originally told the wait was an hour and a half. We were prepared to wait, but told the host that we were willing to sit outside, at the bar, at the counter, anywhere really and our estimated wait time was reduced to 15 minutes! So instead of going across the street for a drink, we had ours sitting on the front curb in front of the restaurant. Ben had the Tamarind Whiskey Sour, with tamarind, lime juice, palm sugar and bourbon. I had Apple Gin Rickey which was apple drinking vinegar, gin, lemon and soda. The Whiskey Sour was really good, I’m not a big whiskey fan, but I definitely could have gotten through one of these on my own. Mine was “interesting” and I didn’t think I liked it. They are really into the drinking vinegars at Pok Pok, and as my drink watered down, I started to appreciate the flavours of the drink. View from the curb while we were enjoying our pre-drinks. We were seated cozy up at on a counter along the walkway of the restaurant. Ben befriended our neighbour, as he’s apt to do, and they peer pressured us into veering away from what I wanted to order because we “had to have the soup!”. So we ordered that as well as 3 other dishes. There was some compromises made, as Ben was craving some ribs, while I some grilled prawns. I gave in though, because Ben loves ribs and I like to please, (I laugh even writing that, because that’s not generally true when it comes to ordering food). I’ll say right now, I’m not happy with the food photos for this post. Not enough light meant, I was forced to use the flash, and not being that familiar with my new camera it was frustrating me to the point that I just took “good enough” photos. Our first dish arrived, Ike’s Famous Fish Sauce wings. This is one of Pok Pok’s signature dishes and my favorite from the restaurant. 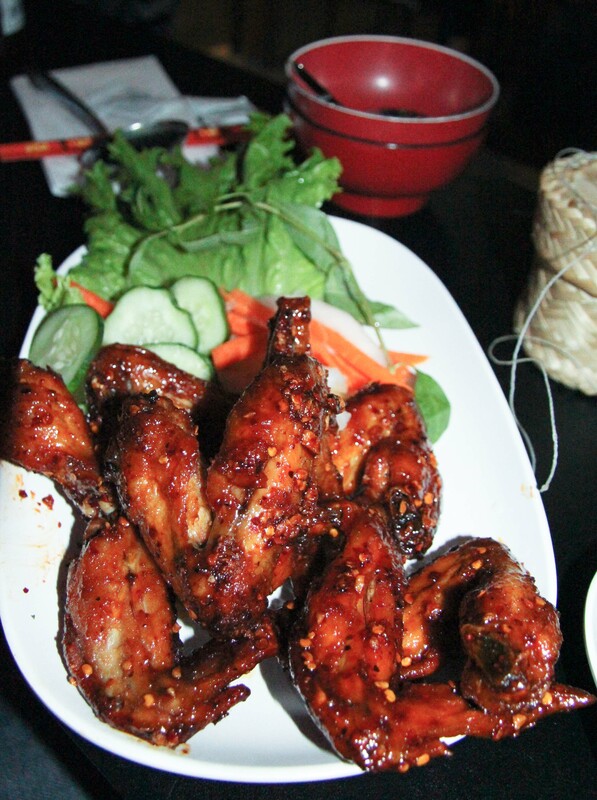 The wings are crispy, sticky sweet with fantastic fish sauce flavour. Order them spicy, as they’re really not spicy at all. You must order this dish if you go to Pok Pok! I won’t put myself out there that often in this blog to say, “you must” so you know this has got to be that good. Just as we were digging in to the first wing, we were served all 3 other dishes at the same time. Food service timing leaves a lot to be desired here. It’s a bit overwhelming to the palate to be served everything at once. Neua Naam Tok- Spicy flank steak salad with fish sauce, cilantro, lime, crispy shallots, lemongrass and toasted rice flour. Wonderful fresh flavours! We were able to get another drink order in about this point, and so I ordered what I remembered to be my favorite drink from my previous visit. Salted plum vodka collins- is a combination of umeboshi(salted plum) with gin, lemon and soda. It’s refreshing and a perfect complement to the spicy dinner. 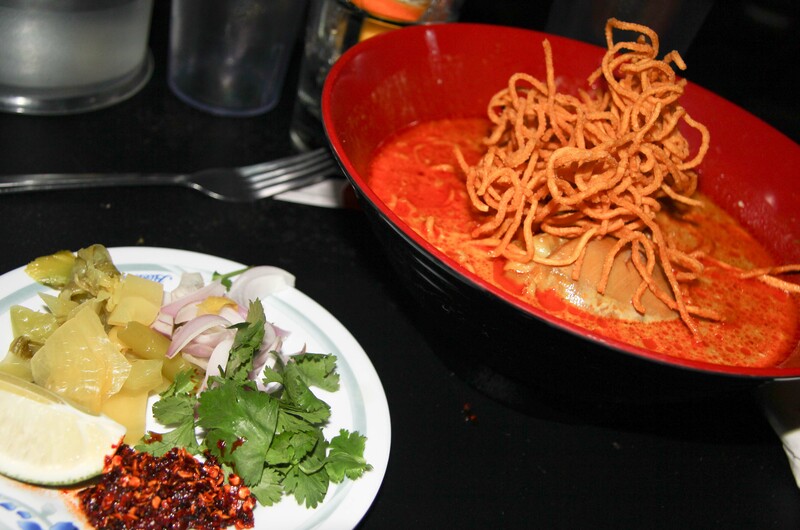 The Khao Soi Kai is a Northern Thai curry noodle soup made with a delicious curry paste and hand-pressed coconut milk. It had delicious ribbon noodles in the broth and crunchy noodles on top. As much as I didn’t want to order a soup dish, I’m glad we did, because it was really good! Finally we had the Sii Khrong Muu Yaang, baby back ribs. 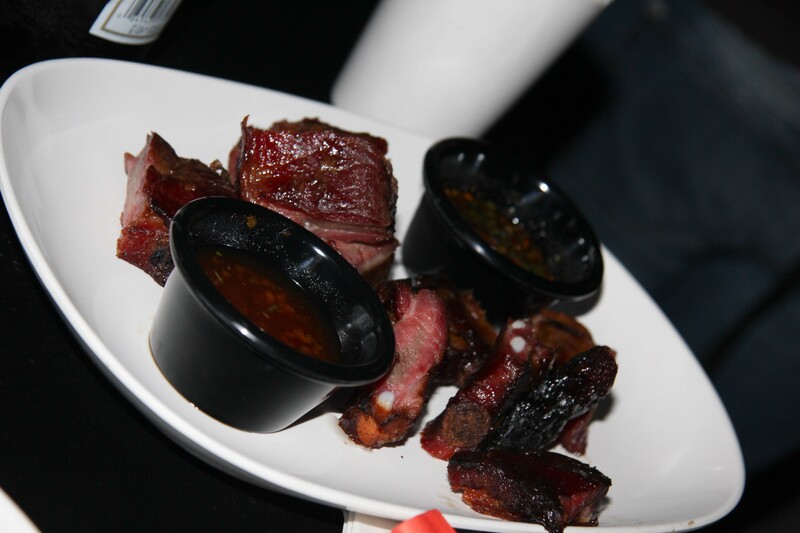 As much as we wanted to like these ribs marinated in whisky, soy, honey and ginger, it really was disappointing. The ribs weren’t fall off the bone, and neither of the 2 dipping spicy sauces was any good. Perhaps my lack of enthusiasm of this dish resulted in such a poor photo of this dish. We were too full from dinner to order dessert, (yes this is common for us). They had mango with sticky rice on the menu but didn’t have it that day. No matter how full I am I’d always order that! 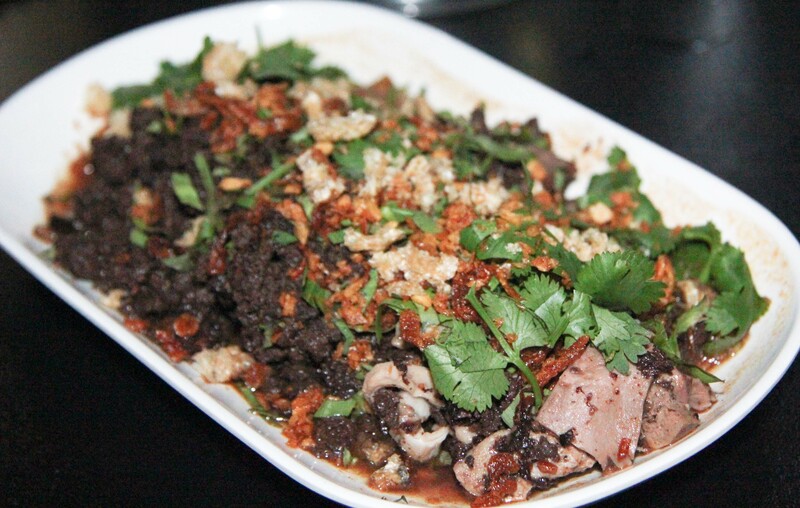 Pok Pok continues to serve interesting Asian food despite the hype. If it weren’t for the poor timing of the dishes I would have loved our meal there. I did like it enough for it to be on my list of places to hit when I return to Portland the next time though!